In our nation's history, there are few images more heroic, more sacred in a civil sense, than that of the Marines raising the flag at Iwo Jima. 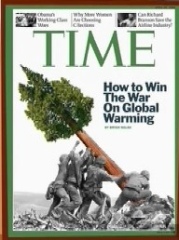 Time has now twisted, and enlisted, that image for its "war on global warming." Time editor Rick Stengel, making his regular Thursday appearance on Morning Joe to tout the week's cover story, naturally thought it was a wonderful idea. He also explained why Time decided to editorialize in favor of a "massive" effort to combat global warming. RICK STENGEL: The cover story, I mean there's been so many stories about the environment and we see them all the time. And they're often just descriptive. And what we decided is we wanted to do something something that was prescriptive. We we wanted to say, you know what? We know there's a problem, we acknowledge there's a problem, global warming exists. Here is a strategy for how to handle it. And by using that famous Iwo Jima image and saying basically what we have to do is what we did before World War II by creating a great national effort, national endeavor, to combat this problem. Using cap-and-trade policy and using new research into renewable energy and having an efficiency surge with energy all across the country. This is this massive effort that is needed. JOE SCARBOROUGH: Rick, was it a difficult decision for you all to take a position where you actually were advocates for a position or is it something that the entire editorial staff decided was the direction you needed to go? STENGEL: I think since I've been back at the magazine, I have felt that one of the things that's needed in journalism, is that you have to have a point of view about things. You can't always just say "on the one hand, on the other" and you decide. People trust us to make decisions. We're experts in what we do. So I thought, you know what, if we really feel strongly about something let's just say so. And we've done that a number of times since I've been back. We did the case for national service, a cover story last summer. The end of cowboy diplomacy where we said that foreign policy had to change. I think readers expect that. I think, look. You guys are up there all the time. On cable television, people are giving you their point of view, giving their opinions on something and people want to know that. So Stengel says readers want to know people's point of view? Well, since he asked, I think Time's cover is a disgrace.